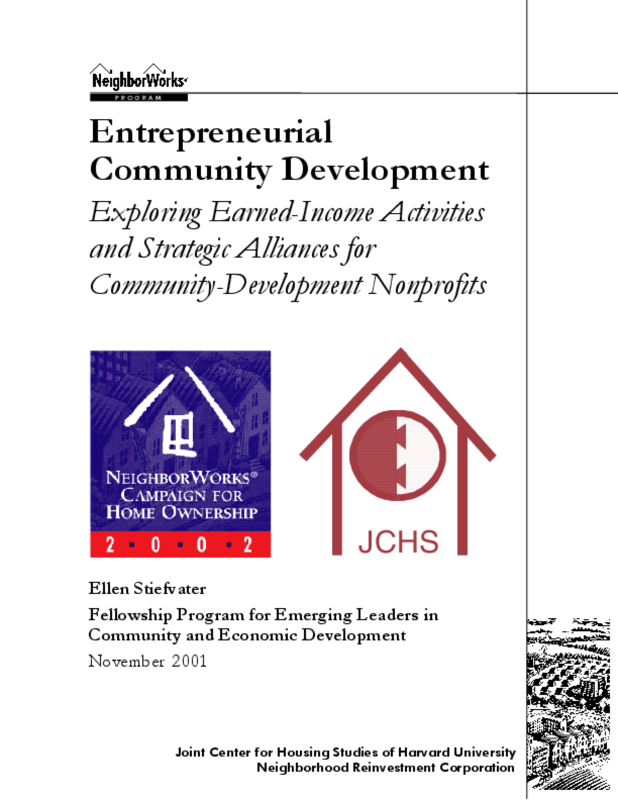 This paper examines social entrepreneurship from a community-development perspective. The target audience is community-development nonprofit organizations. The paper begins by contextualizing social entrepreneurship in community development and creating an analytical framework in which to think about efforts of organizations to integrate entrepreneurial and businesslike thinking. The paper presents key findings regarding both earned-income activities and strategic alliances as options for these organizations, as well as 10 key issues that arose as factors that impact their successful implementation. Information was gathered through a literature review, 29 interviews of practitioners, policymakers and academics and a survey of 59 community-development nonprofit organizations. Copyright 2001 Ellen Stiefvater. The Neighborhood Reinvestment Corporation (dba NeighborWorks® America) has full rights to use and distribute this document.